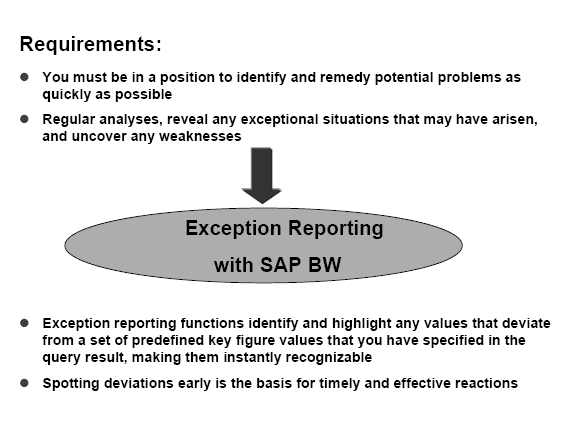 SAP BW Reporting Agent is needed in the following scenario. Your company often uses queries which result in a large volume and range of data. You want to execute these queries in the background so as not to reduce system performance during the working day. You want to be able to react immediately, if any query results fall outside the value interval defined by specified threshold values. To help you do this, you want an overview of any deviations to be displayed after each report. If the deviations are serious, you want to receive a mail notifying you of the situation. You also want to be able to schedule various print requests to run in the background. 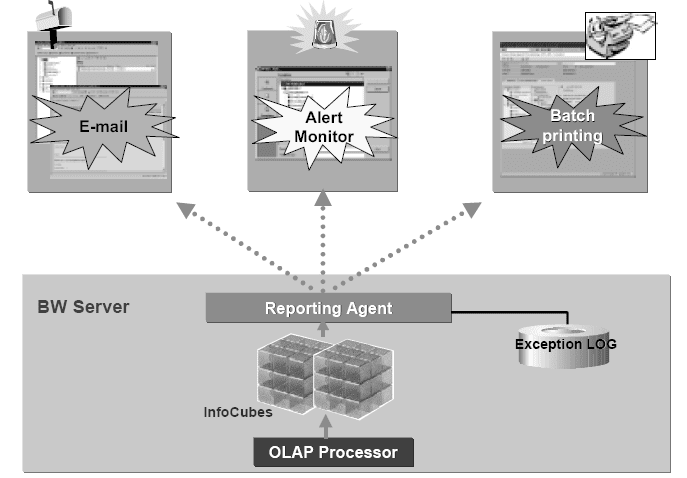 Exception reporting with automatic follow-up activity .The results are displayed in the Alert Monitor, or sent to the persons responsible by SAP Office Mail. The evaluation of exceptions online when you execute a query. The evaluation of exceptions in the background. And the Alert Monitor (notifies you that exceptions have occurred). 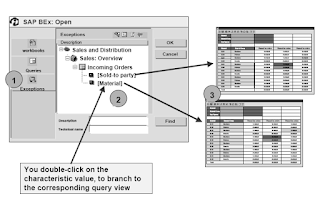 Exceptions are defined on the query level.You determine a threshold value, or an interval between two values, for a key figure that you want to monitor in the query definition. Drag the key figures and characteristics that you want to use into the lists in the query definition. You choose Exception -> New Exception to get to the template where you define the exception. You determine threshold values or intervals for key figure values, and assign message priorities to them. The message priorities determine the warning colors displayed in the query result. The more the results deviate from the threshold values or value intervals that you specified, the more intense the color, and the more serious the warning. There are nine shades of the traffic light colors, red, yellow and green, each representing a different level of warning. 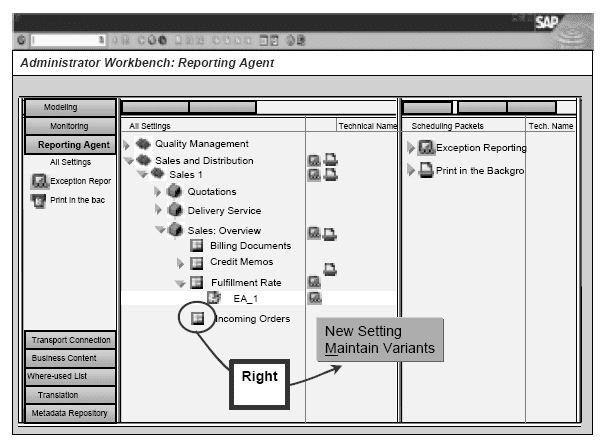 You make the settings for background exception reporting in the Reporting Agent, which you call from the Administrator Workbench. To schedule a query for background exception reporting, drag the mouse over the query name in the central window. Click the right mouse button, and choose New Setting. If you need to specify a variable right at the start of the query, you have to make sure that you have maintained at least one variant before you start. In this variant, you determine which variable(s) are applied at the start of background reporting so that processing can begin. To create a variant, drag the mouse over the query name in the central window. Click the right mouse button, and choose Maintain variants. It is, of course, possible to create several variants for a single query. 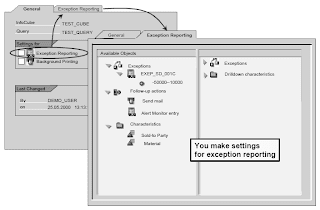 In the General tabstrip, put a check in the box next to the Exception Reporting field. You make your settings on the Exception Reporting tabstrip. The threshold values or intervals that you defined in the query definition, and that trigger a followup activity whenever they occur. The values are stored under Exceptions. 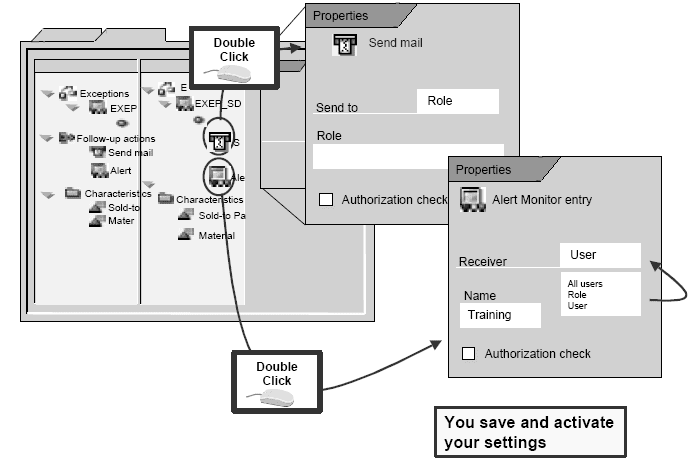 Types of follow-up activities for exceptions are; sending an e-mail using SAP Office Mail or Internet mail, and displaying an entry in the Alert Monitor. You specify the type of follow-up activity for each of the exceptions. Drilldown characteristics for the individual views of the exception. 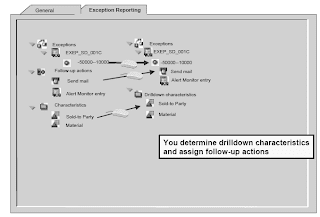 Since the exceptions are saved as views with a single characteristic in the drilldown, you have to specify all the characteristics that you want to be able to use in a view once the follow-up process is complete. How many views there are depends on the number of characteristic values. To restrict the number of views, order the characteristics according to how many values they have, starting with the characteristics with the least values. 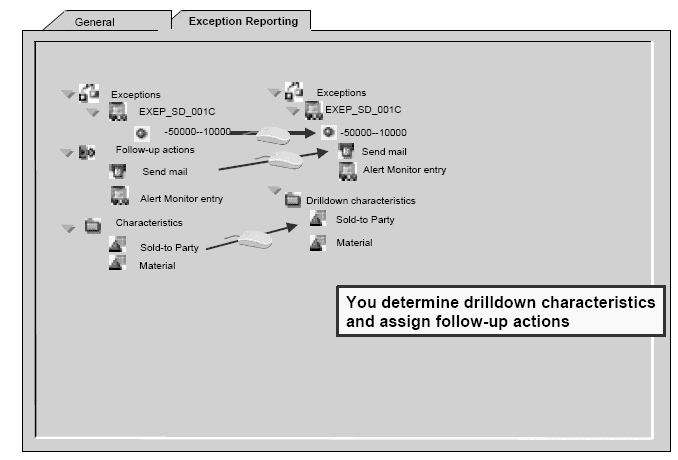 You must make the settings for the follow-up activity before you are able to continue processing the exception. 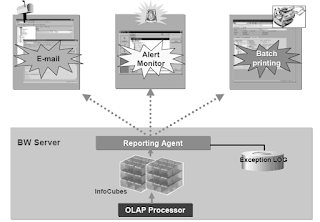 If you want to use the exception in background processing, maintain the relevant parameters for the Alert Monitor at this stage. 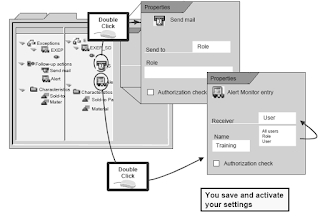 You have to save and activate the exception settings before you can use the exception in your analyses. Make sure that the Change mode is active (is displayed in the right-hand window). Note that in the Change mode only one user at a time is allowed to change the packets in the packet tree. First, create a packet. 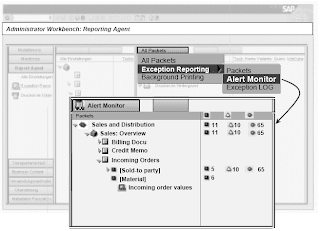 Click with the right mouse-button on Exception Reporting, and choose Create New Packet. Give the packet a name, and save it. Drag into the packet the Reporting Agent setting that you want to use. Note: If you have maintained one or more variants for the query, assign a variant to the Reporting Agent setting at this point. 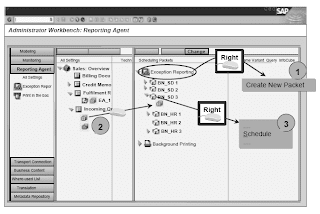 This variant is then selected automatically at the start of the background reporting. To assign the variant, click with right mouse-button on the Reporting Agent setting, and choose Assign variant from the context menu. Select the variant you want to use, and confirm your selection. 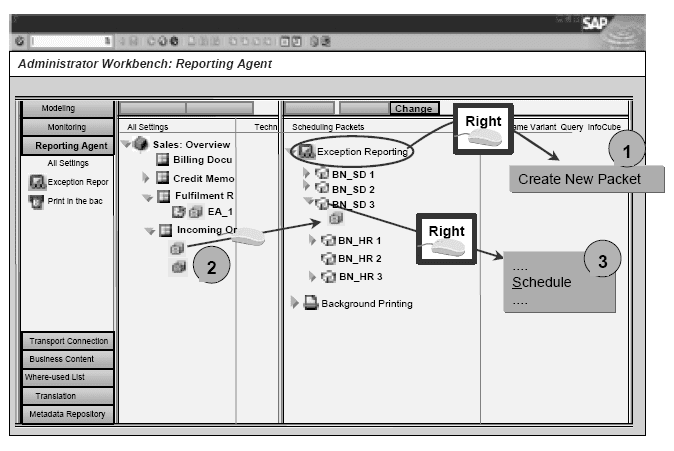 The system transfers this selection of variants when you start the background reporting. Schedule the packet for processing. Click with the right mouse-button on the name of the packet and choose Schedule. 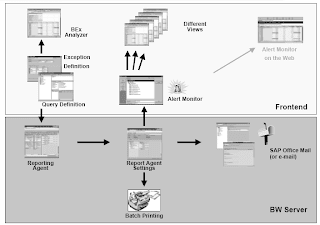 Once background processing has finished, and if you have assigned the follow-up activity Alert Monitor Entry to an exception in the Reporting Agent settings, you check whether the current values deviate from the threshold values or intervals that you specified. 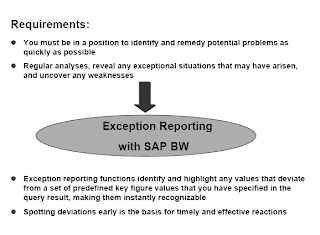 SAP BW has two functions that enable you to do this: The Alert Monitor in the Reporting Agent, and the BEx Analyzer. 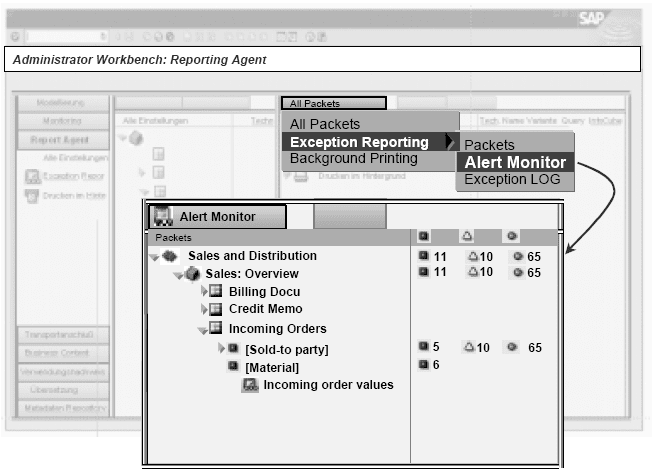 In the Reporting Agent, call the Alert Monitor using the menu path All Packets - Exception Reporting - Alert Monitor. An overview of all the InfoAreas and the warning messages belonging to them is displayed. Choose your InfoCube, and the corresponding query. 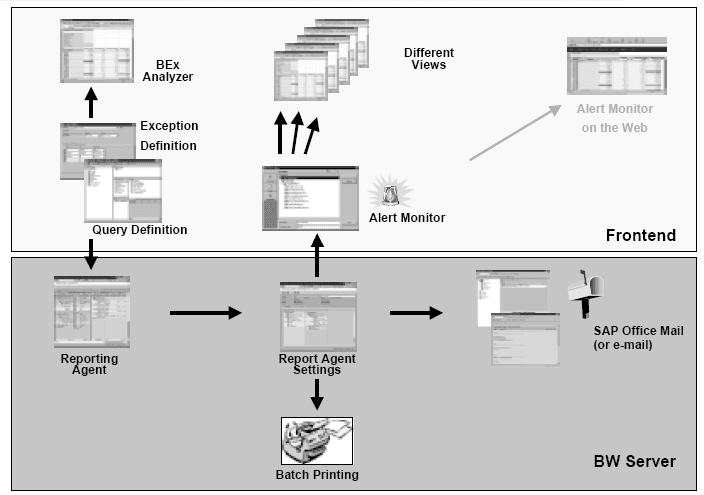 The warning messages that are assigned to the individual characteristics in the query are displayed. There is one warning message for every view of the characteristic you chose first in the exception reporting definition. The exceptions are stored as simple views, with one characteristic per view in the drill down. If you double-click on the corresponding characteristic, you get an immediate view of the query showing the drill down for this characteristic. You can also access the Alert Monitor funtions from the BEx Analyzer. 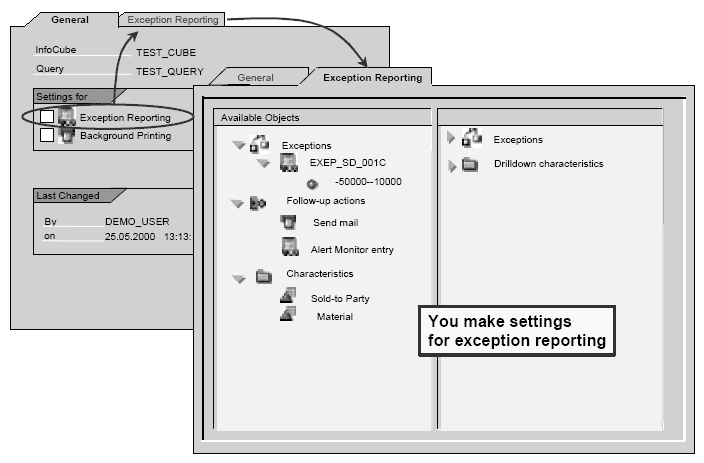 Open the BEx Analyzer, and choose New - Exceptions (1). 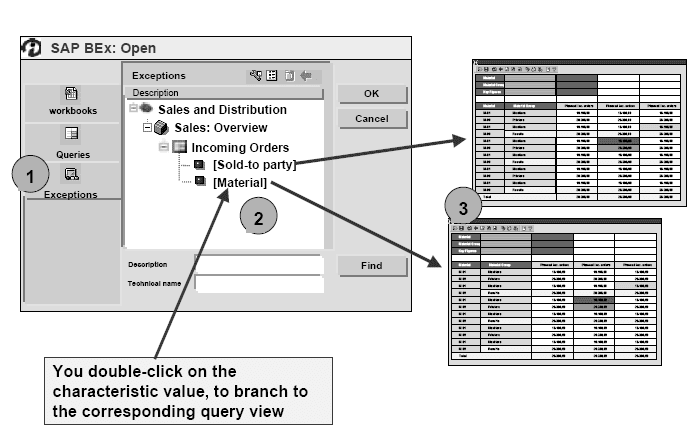 Expand the object tree until you find the query you are looking for (or use the search function). If you double-click on a characteristic, you get a view of the query determined by the characteristic you have chosen (3). You can call various views of the query, depending on the default settings for the drilldown characteristic in the Reporting Agent. If you are working in Workplace, you can display the alerts on your Workplace screen, and call the view that you want to see from there.